Today Joshua and I headed up to our new place with the intention on painting the ceilings; however by the time we got to our place, figured out what we needed, got what we needed, and came back there was very little time for us to begin any painting. We decided since we have the stuff next weekend will be all about painting. We got what we needed from Lowe’s which was located in a brand new shopping center 1.5 miles away from my house; this shopping center has a Starbucks, Subway, annnnnddddd CHILI’S! Yes, Chili’s is going to be exactly 1.5 miles away from my new home. I am in HEAVEN!!! 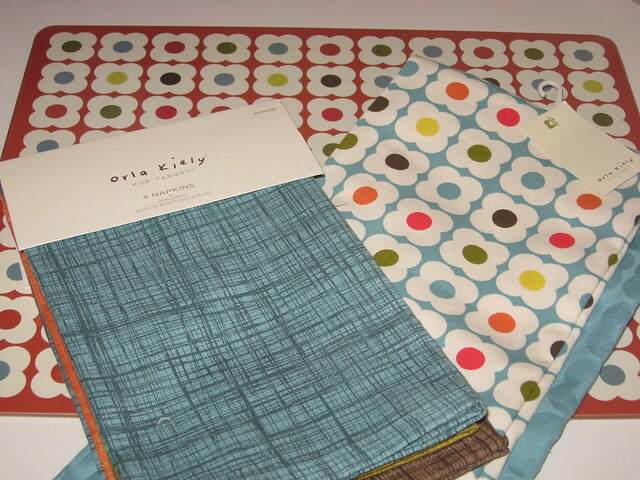 I swung by Target where I picked up a couple of goodies from the Orla Kiely collection for my new place. The orange placemat I am going to use for my cats’ food dishes. I like it because it’s a hard mat made out of cork board and won’t bend like all the plastic ones seem to do. I love colors of her entire collection! I had to exercise a lot of restraint from tossing everything from her collection into my shopping cart, hehe!